See that lost, uncertain look in Thomas Jane’s eyes in that picture above? It’s there in every scene in “Vice,” almost to the degree that I think he’s winking at the audience at times—Yes, I know this is B-movie junk, but I needed the paycheck. Just go with it. The problem with “Vice” is that it can’t even fulfill those low, for-the-money, pure escapism expectations. It’s one of those nearly straight-to-VOD pieces that fluctuates between boring and offensive, never rising above either adjective. Some will dismiss it by saying it’s so ineffective as to never really aggravate critical faculties, but that doesn’t mean it’s not a complete waste of time and talent as well. In a not-too-distant future, the elite have access to a virtual reality playground that allows them to live out their wildest fantasies with “Blade Runner”-esque androids who look and behave exactly like real people. Always wanted to rob a bank and shoot your way out of the ensuing conflict? Go to Vice, run by the above-the-law Julian (Bruce Willis). Of course, as in all Hollywood condemnations of violent video game culture (which is what this is at its core), the violence of this fantasy world bleeds out into the real world, making problems for tough-as-nails cop Roy (Jane). The paper-thin idea being that if people are allowed to give into their wildest fantasies, they won’t be able to distinguish between them and reality. And so the people who get ultra-violent in the world of Vice continue that in Roy’s district, leading him to target Julian as public enemy #1. Meanwhile, Kelly (Ambyr Childers, so great in the underrated “We Are What We Are”), a replicant in the world of Vice who goes through every day thinking that’s a special one and usually ends up killed, has become self-aware. Without warning, her system malfunctions, and she’s overloaded with memories she shouldn’t have. Self-aware, she goes on the run, even tracking down her creator and helping Roy topple the corrupt adult playground of Vice. If it sounds familiar, it should. Borrowing liberally from classics like “Blade Runner” and dozens of quasi-sci-fi non-classics like “Virtuosity,” “Vice” feels as artificially replicated as the androids in its narrative. Judged superficially, “Vice” does nothing that hasn’t been done before with more style and substance. The movie is visually dull even when judged against its low-budget, essentially straight-to-VOD brethren. Most people don’t come to movies like “Vice” for complex visual storytelling, but that doesn’t mean we should excuse cheap sets, dull framing and other signs of lazy filmmaking. Even if it didn’t work as art or escapism, “Vice” wastes an opportunity for social commentary as well. Roy is a non-character, almost so inconsequential to the storyline that poor Jane doesn’t look like he’s been directed to do anything in the climactic scenes. Even the director realized they didn’t need him. 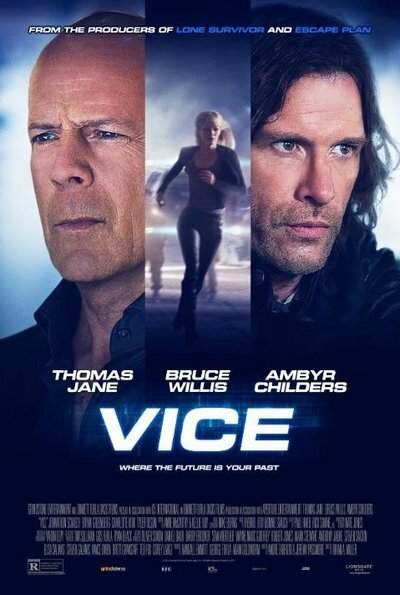 Worst of all, “Vice” is about giving personality and life to an android female who has been created as a plaything for men to abuse and behave with without repercussions. And yet turning Kelly self-aware doesn’t make her confident and driven. It sends her back into the arms of her male creator, turning her into a damsel-in-distress who can only be saved by a man. That’s a bad B-movie concept of identity. And by the time director Brian A. Miller finally gives Kelly something to do, it’s in the most generic “tough action movie chick” way possible. The talented Childers deserves so much better. Heck, so does Thomas Jane.